Though not as acclaimed as The Wind Waker or The Minish Cap, The Legend of Zelda: Four Swords Adventures amassed a following of its own when it was released in 2004. It successfully expanded on Four Swords, allowing the multiplayer gameplay to stand on its own. Satisfied with their work, the team that worked on Four Swords Adventures reassembled for a new project in May of 2004. During this time, much speculation surrounded the release of Nintendo’s newest handheld console: the DS. In stark contrast to the Game Boy product line, this console was to feature two screens. While the top screen boasted a standard design, the bottom one was a touch screen. One month before the DS’s North American launch, Shigeru Miyamoto expressed interest in bringing Four Swords to the new console. In an interview at the Electronic Entertainment Expo in 2005, Eiji Aonuma, who had directed the series’ 3D installments, confirmed that a new entry in their The Legend of Zelda franchise was indeed being produced. However, though the team had discovered the potential of cel-shaded graphics on the DS, they opted to create a single-player experience instead. When asked about this shift, Mr. Aonuma remarked that the idea never reached the development phase. Any further speculation was put to rest at the Game Developers Conference of 2006 wherein this project had a name: The Legend of Zelda: Hourglass of Fantasies – or Phantom Hourglass as it was to be called internationally. Though the comparatively disappointing sales of The Wind Waker affected Mr. Aonuma on a personal level, he wished to continue the game’s style in another form. During the Electronic Entertainment Expo of 2007, he claimed that the gameplay of Phantom Hourglass would be exactly what the aging Zelda formula needed to stay relevant in a new generation. It didn’t take long for enthusiasts to learn what he was talking about. 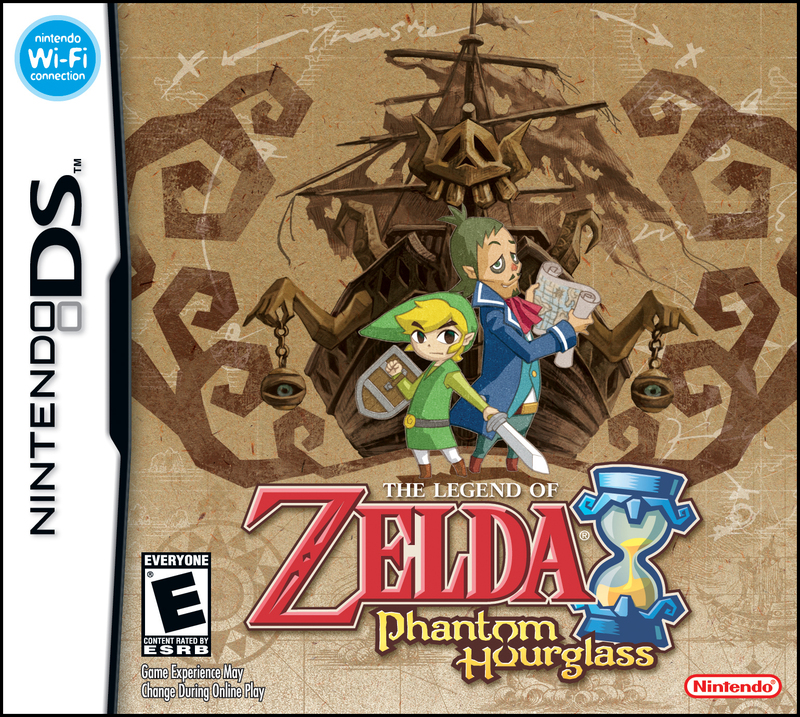 Phantom Hourglass was to forego a traditional control scheme in favor of having the players exclusively use the touch screen to control Link. It was around the time of the release of Twilight Princess in 2006 that The Wind Waker received a reevaluation of sorts. Suddenly, the game fans dismissed was being hailed as one of the GameCube’s finest offerings. Having the same art style as The Wind Waker along with boasting a novel control scheme made Phantom Hourglass the new handheld console’s most anticipated game. Due to Mr. Miyamoto dedicating a lot of his time to developing Twilight Princess, he had not been able to get involved with Phantom Hourglass at all. Twilight Princess was delayed numerous times due to Eiji Aonuma wishing to implement an entirely new control scheme for the game’s Wii version. By the time they released Twilight Princess, Phantom Hourglass was in a nearly complete beta form. Such was the extent of his enthusiasm that he begged Satoru Iwata to delay the game so he could get involved with the creative process. Mr. Miyamoto apologized to fans, but promised the title would be “much better”. Phantom Hourglass was released domestically in June of 2007 before debuting internationally the following October. The praise for this game was nearly unanimous with several websites naming it the greatest DS game of 2007. By March of 2008, four million copies had been sold worldwide. Nonetheless, even in the face of its positive reception, certain publications were a bit skeptical, believing Nintendo had been attempting to draw in only causal enthusiasts, offering nothing to longtime players. Was Nintendo’s return to the Zelda franchise’s handheld scene able to stand in the face of its three predecessors? WARNING: The following review will contain unmarked spoilers for both this game and The Wind Waker. Several months have passed since the events of The Wind Waker. After defeating Ganondorf and permanently sinking the ancient kingdom of Hyrule, Link and Tetra set off on a new adventure. While sailing the Great Sea, they encounter the Ghost Ship. This mysterious vessel is said to sail the waters, abducting sailors and inhabitants from nearby islands. Tetra, believing the Ghost Ship to be a gang of troublemaking pirates, decides that teaching them a lesson is in order and jumps aboard. A few seconds later, she screams for help as the ship pulls away, vanishing with her onboard. Link attempts to jump to the ship, but falls into the ocean. He washes up ashore a new island called Mercay. There, he awakens to a voice belonging to a fairy named Ciela. After informing her of his plight, Ciela joins Link and tells him to visit her grandfather Oshus. 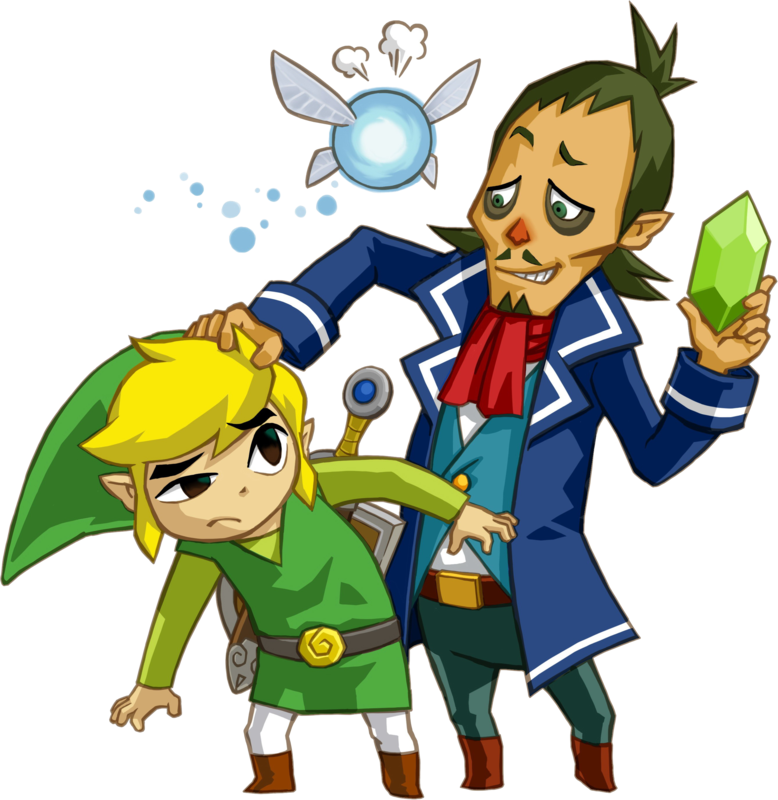 Though the old man attempts to dissuade Link from chasing after the Ghost Ship, he relents once he is fully convinced of the young boy’s determination. He tells Link to meet a man by the name of Captain Linebeck. As it turns out, the captain journeyed to the Temple of the Ocean King in search of treasure. Once Link and Ciela meet him there, he claims he hurt his ankle and cannot escape. Before Link steps forward, Linebeck informs him that the temple drains the life out of any living being foolish enough to stay in it for too long. After rescuing him, the captain immediately runs for the exit. Unimpressed with Linebeck having faked an injury, Ciela calls him out. Before the argument becomes too heated, Oshus arrives on the scene. He gives Link the task of restoring the three spirits of Power, Wisdom, and Courage from temples on distant islands. Linebeck, expressing interest in finding the Ghost Ship to plunder its valuable treasures, reluctantly agrees to travel with Link and Ciela, allowing them use of his steamboat. Link sets sail with his two new companions in search of the three temples, hoping to save Tetra before she meets with a terrible fate. Phantom Hourglass is a 3D game like The Wind Waker, but it is, for the most part, presented from a top-down perspective – making it a first for the series. Someone who hadn’t engaged with any of the promotional materials might assume based off of this that Phantom Hourglass would represent a return to form of sorts with its interface. 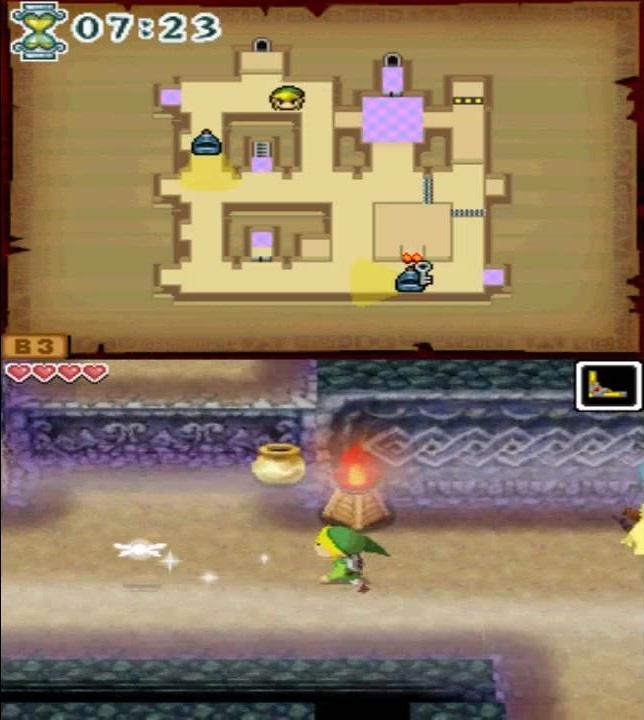 As it stands, the similarities Phantom Hourglass shares with its top-down predecessors only extend to their vaguest surface elements. 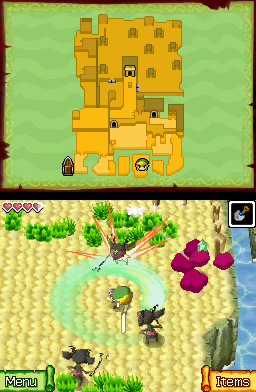 Being a DS game, Phantom Hourglass utilizes two small screens for its gameplay. The top screen typically displays a map of the area. Because it updates in real time, there is no need to pause the game to examine it. The bottom screen, on the other hand, is where a majority of the action takes place. You guide Link’s movements by holding down the appropriate parts of the screen with the stylus. Much like the Wii version of Twilight Princess, the sword is not used by pressing a button. Instead, you execute sword attacks by quickly drawing the stylus across the screen. The usual rule to keep in mind is that the direction of your hand’s movements translates to how Link slashes the sword. You can also tap a specific onscreen enemy, causing Link to single it out for attacks. By quickly drawing a circle around him, he executes the series’ famous spin attack. Moreover, much like in A Link to the Past, Link automatically has his shield at the ready in battle; it blocks attacks emanating from the direction he faces. Every Zelda installment that debuted on a handheld console featured similar interfaces wherein Link could equip any two items assigned to the “B” and “A” buttons. This doesn’t apply to Phantom Hourglass because the buttons aren’t extensively used for gameplay. In fact, you can’t even access a menu by pressing the “START” button; doing so only gives you the option to save and quit. Instead, there are two options adorning the bottom-left and bottom-right corners of the screen labeled “Menu” and “Items”. Using the “Menu” option, you can save the game and examine the map. You can also look over your collection of plot-important items. True to its name, the “Items” option allows you to examine your inventory. Maps have are more of a factor in gameplay than before. By bringing the map down to the touch screen, you can draw on it. You will be using this feature extensively because there are many moments in which it’s required to travel down a certain path to proceed. Barring that, it can also be used as a notepad. Because Phantom Hourglass was originally released on a portable system and the player could very easily be somewhere without a means of taking notes, this is greatly appreciated. Unlike a majority of the preceding Zelda installments, you can only equip a single item at a time. Using an item is a bit more of an involved process than in older Zelda titles. To have Link prepare to use an item, you can tap the circular window containing its icon. From here, you must go through the proper motions to utilize it. You can also ready the item by holding down one of the shoulder buttons. The first item is discovered in the Temple of Fire, and it so happens to be a boomerang. This weapon has been a mainstay of the series since the beginning, and it serves a very similar function in Phantom Hourglass as it did in Oracle of Seasons and The Wind Waker. With the gameplay revolving around the DS’s touch screen, it distinguishes itself from past incarnations not in what it does, but how one uses it. When you ready it, you are then made to draw a path for the weapon to travel. Once you’re finished, the boomerang will sail through the air in the exact pattern you drew. The introduction of the boomerang foreshadows the nature of the dungeon items to follow. Every single one you find has made an appearance in some form in a previous installment. Later on, you will find a bomb bag, a shovel, a bow, a hammer, a bombchu bag, and a grappling hook. A large part of the appeal of Phantom Hourglass is being able to use this novel control scheme to use these familiar items in new ways permitted by the touch screen. It’s clear that with this installment, Nintendo chose to place innovation first, offering an experience none of their competitors could have conceived. Unfortunately, I also have to say this game’s array of items makes the game a little too predictable. Part of what made Twilight Princess such a quality installment was that, like The Minish Cap before it, the items found in dungeons were mostly fresh and original. Meanwhile, a majority of the reintroduced items found entirely new utilizations such as a bow that could shoot exploding arrows or a boomerang capable of conjuring a whirlwind. Though much of the Wii version’s appeal lied in how motion controls allowed players to use old items in a new way, Mr. Aonuma’s team wasn’t overly reliant on them as a fallback. The same can’t really be said of Phantom Hourglass. It is easy for a savvy player to take note of the various, strategically placed obstacles as well as certain merchants’ inventory and realize exactly what is in store for them. Do you find posts littering the landscape? That means you’re getting the grappling hook soon. Have you been noticing more weak walls lately? If so, you know the game will hand you the bomb bag shortly. It’s true that some areas have a variety of obstacles practically begging for players to smash, explode, shoot, or latch onto in an effort to encourage exploration, but this leads to another issue with the game. Though The Wind Waker was a critical favorite from the beginning, one facet proved to be a point of contention. Specifically, sailing the Great Sea involved magically directing the wind and sailing in the appropriate direction. Many felt it made basic exploration a long, drawn-out process owing to large stretches wherein nothing significant would happen. Setting sail on the S.S. Linebeck reveals just how different sea travel is this time around. Because the S.S. Linebeck is a steamship, you don’t have to worry about directing the wind or adjusting your sail in response. Sailing is now a simple matter of drawing a route to your intended destination. On the surface, it would appear the team behind this game took those criticisms to heart by giving players a new and improved system for sailing the ocean. However, there are several factors that actually make sailing even more tedious than it was in The Wind Waker. Owing to the game’s significantly smaller screen compared to a standard television set, it’s easier to lose focus when sailing – especially if you neglected to bring headphones and are playing with the sound muted. This would be inadvisable because you will often find yourself besieged by monsters prowling the oceans. Though this happened on occasion in The Wind Waker, there is one factor in particular that makes them much more of a threat: the S.S. Linebeck has its own life meter. Furthermore, the damage monsters inflict upon it always equates to a single heart on the meter. To defend itself, the steamship is eventually outfitted with a cannon that fires in the general area the player taps with the stylus. Because you don’t have direct control over the ship when it’s in motion, the only reasonable way to avoid getting hit is to knock an enemy’s attack out of the air. This wouldn’t be so bad except monsters’ attacks are incredibly accurate. While the cannon is easy to aim, you can only over fire one shot at a time. This means if multiple enemies attack at once, you will likely take at least one hit regardless of how fast you are. Raising the ship’s endurance isn’t a straightforward process either. During your travels, you may eventually obtain custom parts for your ship. In order to make the vessel more durable, it’s necessary to collect a matching set of parts. Certain number of matching parts will afford the ship an extra heart. I like this idea in theory because it encourages players to experiment and actively seek out new ship parts. In practice, I’ve found one doesn’t really have much control over which ship parts they receive for a given task. On some level, I understand this because if they were in fixed locations, players would complacently seek out the first matching set and never have a reason complete any remaining sidequests that offer them as a reward. However, because there are a total of eight different ship parts, it is very possible to go the entire game without adding more than two hearts the meter – even if you complete every sidequest as soon as they become available. 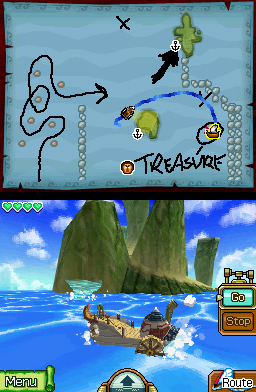 Much like in The Wind Waker, there are several treasure maps littered throughout the game. Whenever you find one, an “X” will appear on the sea chart. In order to fish them out of the ocean, you need a ship upgrade called the Salvage Arm. The process isn’t as simple as it was in The Wind Waker wherein you could simply sail to the location and use the grappling hook to obtain the treasure. You must navigate the arm past several strategically placed mines in the ocean. The arm can only take five hits before it’s rendered unusable. Only by speaking to a repairman on Mercay can it be fixed. While I can appreciate making the player play an active role in obtaining the chests, it amounts to busywork more often than not. Not only that, but the arm is amazingly difficult to control. Using a meter on the bottom of the screen, you can guide the arm left and right in addition to having some control over its speed. The infuriating part is that mines can appear out of nowhere and the arm typically doesn’t react fast enough to your commands to dodge them. To make matters worse, the arm doesn’t have many invincibility frames, meaning it can take two or more hits in rapid succession. It feels as though this minigame tried solve a problem that never existed in the first place. After all, in The Wind Waker, most of the challenge lied in obtaining the maps in the first place. 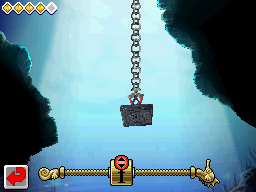 In Phantom Hourglass, the maps are easier to find, yet getting the treasures is rendered much more tedious. After obtaining the Spirit of Power, who was being held captive by a monster in the Temple of Fire, Link makes a return to Mercay to speak with Oshus. There, he is asked by the old man to obtain another sea chart resting deep within the Temple of the Ocean King. Everyone who has played Phantom Hourglass to completion has a strong opinion of this dungeon, and I do not intend to mince words expressing mine. As of its release, this temple was the single most annoying dungeon the franchise had known. It’s to the point where I’m convinced that anyone who believes the Water Temple from Ocarina of Time is the worst dungeon in the series hasn’t played this game. As Link’s first attempts at exploring it have told you, the temple drains the life energy out of anyone who stays in it for too long. To help him, Oshus presents him with the titular Phantom Hourglass. As long as the timepiece has sand remaining, Link can venture from the temple’s safe zones without taking damage. From the onset, it protects Link for ten minutes, and it does not count down if he is in a safe zone. The hourglass can’t simply be flipped; only the rays of the sun can restore its power. Patrolling the lower levels of the temple are Phantoms. Link cannot defeat these foes in a direct confrontation. If he is spotted, a dramatic musical cue plays and all of the Phantoms on the floor will begin closing in on him. By staying out of their sight long enough or retreating to a safe zone, the Phantoms will give up their chase and resume their normal patrol. If he is struck down by a Phantom, he takes damage equal to one heart and is returned to the entrance of the floor with thirty seconds being deducted from the hourglass. To be fair, there’s nothing particularly untoward about this gimmick in of itself. Even in the console installments, the series had been inconsistently good when it came to implementing stealth sections. Because they’re a backbone of gameplay as opposed to an isolated section, it prompted the developers to find ways them tolerable. I could tell when playing Phantom Hourglass that they took cues from games which completely revolve around stealth while fully comprehending what makes them work. By looking at the map screen, you can see the Phantoms’ field of vision. The cone turns red when Link is spotted. Not only that, but if you make enough noise, you can attract their attention, which is indicated by a question mark appearing above their icon. All in all, these stealth sections are a good foil to the more action-oriented gameplay that comprise the rest of the experience. It’s a shame that the goodwill is wasted due to one minor detail: you have to explore the dungeon several times. While you can open up shortcuts using the newest item you found, it doesn’t change the fact that you’re doing the exact same things every time. Like fishing treasure out of the ocean, this doesn’t add anything substantial to the gameplay; it’s just padding. There is a portal that can be used to warp Link to the temple’s halfway point, but it deducts time depending on how long it took for him to reach it. Most players would respond to this by returning to the entrance and speed through the temple as fast as possible. Again, this is just additional busywork in a game that already had entirely too much. On a more basic level, there are quite a few aspects about the interface itself I’m not particularly fond of. I don’t like how the control scheme makes it difficult to multitask. This is because every substantial action is executed with the touch screen. Predecessors easily allowed Link to move and attack at the same time owing to the two separate actions being carried out with different thumbs – one on the control stick and the other pressing the button. Not only that, but attempting to attack with the sword without targeting enemies is quite cumbersome. Attempting the default attack is significantly more difficult when your hand is partially blocking the screen – you often can’t see the enemy or the range of the slash. When I reviewed Link’s Awakening and the Oracle duology, I remarked that the small number of buttons ensured you had to pause the game too many times to swap inventory items. Owing to the smaller array of items available to Link in Phantom Hourglass, it isn’t as much of an issue here, but it’s irritating for a different reason. This is because the game does not pause as you’re switching items. Though it takes less time than it did in any previous game, you’re leaving yourself vulnerable should you need to swap items when enemies are bearing down on you. What’s particularly tragic about all of these grievances is that I can tell there’s a great game buried underneath them. The dungeon design, though boring from a visual and musical standpoint, has a lot of creativity to it. The developers seemed to find many inventive ways to utilize Link’s limited inventory, notably avoiding the reoccurring issue of items being useless outside of their respective dungeons. Indeed, once you obtain an item, you will be using it extensively for the rest of the game. This allows the gameplay to build on itself. What I particularly admire about this game is how much the DS’s unique hardware is incorporated into the puzzle solutions. In order to even enter the Temple of Fire, you must extinguish the flames on two large candles. To do this, you must blow into the built-in microphone. There’s also a puzzle roughly halfway into the game in which you’re shown an inverted version of the sea chart and you have to transfer the location of the important treasure onto Link’s own map. Because the inverted chart is displayed on the top screen while the one Link uses is on the bottom, the solution is to close the DS, thus imprinting the mark. By this point in its long history, the Zelda franchise became well known for having great boss fights. Even in the face of its myriad flaws, Phantom Hourglass is no exception. The very first boss splits itself into multiple copies, requiring Link to throw his boomerang at them in a certain order. The order is revealed in a subtle way that tests one’s observational skills. On the map, the copies of the boss are displayed as a skull each with a different number of horns. To defeat it, you have Link throw the boomerang in according to the number of horns on each icon. Later boss fights are elaborately designed as well. By the end, Link will have fended off four ghosts by reflecting their energy back at them, slain a two-headed dragon capable of manipulating the tides, and teamed up with a young Goron to defeat a dinosaur-like creature. When it comes to parsing the story of Phantom Hourglass, it is difficult to avoid drawing comparisons to Link’s Awakening. After all, Phantom Hourglass was the first handheld Zelda installment since Link’s Awakening developed by Nintendo themselves with Capcom and Flagship serving that role for the Oracle duology and The Minish Cap. Not only that, but Phantom Hourglass shares a distinct similarity with Link’s Awakening by being a handheld sequel to a console game. The most striking thing about the plot of Link’s Awakening was the sheer amount of ambition that went into writing it. In 1993, portable gaming was seen as a mere novelty. Titles created for such platforms could be overlooked if they were mediocre or even outright bad simply because the idea of being able to bring any game along for the road was enticing. Nobody could have predicted that with Link’s Awakening, scenario writer Yoshiaki Koizumi would help video game storytelling evolve from being mere instruction manual filler to a part of the experience enthusiasts adored. It is thanks to Link’s Awakening that Eiji Aonuma began taking the series in innovative directions once he found himself in the director’s chair. Given the legacy of its predecessor, one may preemptively draw the conclusion that the story of Phantom Hourglass couldn’t possibly compete against it. In this case, such a supposition would be entirely correct. In the interest of fairness, there are a few things I do like about it. One slightly disappointing aspect about Ocarina of Time concerned the medallions Link was made to find after the first act. The text would state that the sage giving Link the medallion was adding their power to his. In gameplay terms, this sentiment meant nothing. Beta screenshots suggested the medallions in question could be equipped, but the concept was ultimately scrapped. Phantom Hourglass seems to revisit this idea in the form of the three spirits of Power, Wisdom, and Courage. Once you’ve freed them all, they join Link in his quest. Scattered throughout the game are orbs corresponding to each spirit. Possibly to avoid overwhelming players with too many sidequests, Heart Containers – not Heart Pieces – can be obtained outside of dungeons once more. After obtaining ten of one type of orb, the respective spirit’s true power awakens, and they can assist Link directly. Leaf, the Spirit of Power, can ignite Link’s sword, increasing the latter’s damage output. If Neri, the Spirit of Wisdom, is chosen, she can increase the defensive capabilities of Link’s shield in addition to reducing the amount of time lost should he be caught by a Phantom. Lastly, it’s eventually revealed that Ciela is actually the Spirit of Courage. When her power is awakened, she can allow Link to shoot beams from his sword. 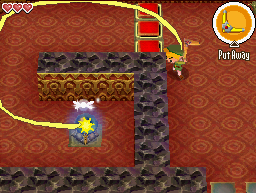 The series has always had something of a problem whenever handling the Courage component of the Triforce, and Phantom Hourglass would appear to be no exception. While Leaf and Neri have several obvious uses, Ciela’s power is situational at best. It could be used in the event Link faces enemies he cannot harm with the sword itself. Otherwise, you’re mainly going to rely on the other two for offense and defense respectively. Fortunately, of all of the words one could be used to describe Ciela, useless isn’t one of them. Before you can replace her with Leaf or Neri, she acts as a pointer of sorts to let you know where the stylus registers. Even after you have the ability to swap her out, she pulls her weight in battle, quite literally, by being the one who wields the hammer. Not only that, but in the final battle, she proves instrumental in the main antagonist’s defeat with her ability to temporarily stop time. You may have noticed that most of my assessment of the plot so far has been of the characters in relationship to the gameplay. This is because I feel its greatest weakness is that there really isn’t much to comment on. Phantom Hourglass is exactly what Yoshiaki Koizumi strived to avoid when writing the scenario to Link’s Awakening. At its core, this game features an unambitious plot that fails to take the canon in new directions. It would be nearly impossible to know from playing Phantom Hourglass first that The Wind Waker had a fair bit of nuance to it. Nowhere was it more obvious than when it handled its incarnation of Princess Zelda. One of the most shocking moments of The Wind Waker occurred when we learned the snarky, confident Tetra was Zelda’s reincarnation. What made this development particularly intriguing was that even after discovering who she is, she still considered herself Tetra first – a point she hammered home when she fought alongside Link against Ganondorf. Absolutely none of that is reflected in Phantom Hourglass. Even before she gets captured, the opening narration fails to mention that Tetra helped Link in battle. Anyone who hadn’t played The Wind Waker would falsely conclude from this that she passively watched Link defeat Ganondorf on his own. In fairness, this was probably to avoid completely spoiling how the final battle panned out for those who didn’t complete the game. What’s less tenable is that Tetra proceeds to get captured. Suddenly, the well-developed character from The Wind Waker is now a one-dimensional damsel in distress. To add insult to injury, when Link finally recovers her from the Ghost Ship, she has been turned to stone, and only by restoring the Ocean King’s power can her condition be cured. What makes Tetra’s non-presence in Phantom Hourglass particularly indefensible is that the writers saw fit to replace her with Linebeck. Though he talks a big game, he doesn’t even bother to hide his cowardly nature, making Link do all of the work while insisting on taking a share of the Ghost Ship’s treasure for himself. He also doesn’t miss an opportunity to berate Link, and by extension, the player, when operating the ship, accusing him of being asleep at the switch whenever enemies fire upon them and yelling at him should the Salvage Arm hit a mine. About the only thing that could have made this worse is if his lines were voice acted. He then proceeds to top his impressive track record when Link rescues Tetra. When he learns that the haunted vessel had no treasure at all, he threatens to leave Link and Ciela to their own devices. It’s only after Oshus, who reveals himself as the Ocean King and guardian of the realm, offers to grant him one wish that he reconsiders. Yes, it’s that particularly obnoxious cliché involving a character changing their mind as though they intended to do the right thing all along the minute somebody offers to give them what they want. It should be noted that Link’s sidekick being less than enthusiastic to help him isn’t entirely unprecedented. 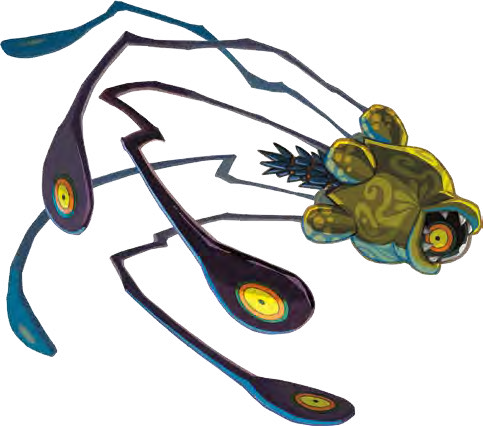 Tatl and Midna were both characters who found themselves assisting him to meet their own selfish ends until they learned of the conflict’s scope. Through traveling with him, they became better people by the time their respective journeys came to an end. Having played those games beforehand, I was convinced Linebeck would in some way redeem himself sometime before the credits rolled. Not only does the moment never occur, further developments made him out to be even worse than advertised. He does perform one heroic deed at the very end of the game, but while it does save Link’s life, it comes across as completely accidental. Exacerbating matters is that this feat is followed up by him being possessed by the main antagonist, meaning you have to essentially fight him in the final battle. In other words, he finally comes in handy only to become even more of an annoyance. Then again, even if one were to count saving Link’s life as a point in his favor, it’s still too little, too late. It doesn’t even begin to make up for the fact that his presence actively hinders Link’s progress at times. During their journey, the S.S. Linebeck is besieged by a pirate named Jolene. 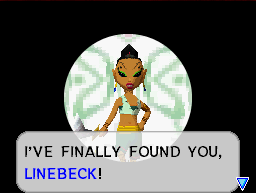 As it turns out, Jolene is after Linebeck, so the latter, being who he is, forces Link to fend her off. This makes sea exploration even more tedious when she continues to show up, and Link has to defeat her every time. She doesn’t bother changing up her tactics in any significant way, and there is little reward to be gained from deliberately seeking her out; she only exists to waste time. When you finally learn of why she bears a grudge against Linebeck, it only continues to cast the latter in a particularly unflattering light. Linebeck once saw a monster attacking Jolene’s ship. He lost control of his own vessel in an attempt to flee, crashing into the monster and killing it. He and Jolene then became friends, but when the former decided to break things off, he left with some of her possessions. Despite this, the narrative seems to insist his antics are hilarious and his cowardice endearing when that couldn’t be further from the truth. One final problem I have with this game’s plot lies with its villain. After revealing his true identity, Oshus informs the protagonists that the cause behind the temple’s curse is a powerful demon named Bellum. Aside from being a powerful demon, meaning the heroes are obligated to stop him, there isn’t much to say about Bellum. His boss fight is both appropriately challenging and well designed, but it doesn’t change that he’s a one-dimensional villain. He wishes to destroy the world because that’s what he does. Following up a game in which Ganondorf was given a surprising amount of depth to his motivations, Bellum is a major disappointment. This seems to underscore just how banal the story manages to be. It’s as though the developers wrote a basic outline of what a Zelda scenario constitutes without any of the artistic touches to make it stand out from the previous canon. Damningly, when it does stand out, it’s for the wrong reasons between rendering an excellent character helpless and introducing an insufferable one in her stead. It is somewhat amusing to see Ciela tell off Linebeck for his avarice and cowardice, but directly pointing out a problem with the writing in lieu of fixing it is rarely a good idea – especially when you’re forcing the player to go along with it. With its novel gameplay and genuinely clever puzzles, I wanted to like Phantom Hourglass a lot more than I did. Unfortunately, after seeing it through to the end, I am left with one unavoidable conclusion – if The Minish Cap was the best handheld Zelda installment at the time of its debut, Phantom Hourglass was the worst. Link’s Awakening may have had its own share of problems and none of its boss fights are as creative as the ones that feature in Phantom Hourglass, but it remains the superior effort. I will admit switching items multiple times to explore the overworld could get irritating, but with a more likable cast and a story that, though problematic, ultimately changed the series for the better, Link’s Awakening has a bit more to offer. Even with the myriad problems I had with Phantom Hourglass, I have to admit I can’t completely condemn it either. I could easily see why somebody would like this game, as really does pitch a lot of innovative ideas. It may do nothing substantial with the canon, but it has just enough excellent moments during gameplay that I could envision somebody looking past its shortcomings. If you particularly enjoyed The Wind Waker, checking this game out wouldn’t be a bad idea. For that matter, if you’re a particularly big fan of the series, I doubt you will find this game to be a letdown. Anyone else approaching this game should take a recommendation with a grain of salt. You’ll likely know within the first few hours if Phantom Hourglass is for you. If you find yourself uninterested in finishing it, I can assure you doing so would not have been worth the hassle. Gahhhh, the Temple of the Ocean King! That is one of my least favorite levels in gaming. It puts together a whole lot of things I hate in the games I play. I hate having a poorly justified timer controlling the pace. I hate one-hit effects with (potentially, in this case) severe consequences. And I haaaaaaaaaaaaaaaaaaate repeating areas. More than anything. Send me through the same level over and over again, that’s a good way to turn me off a game. Moreover, it’s interesting to me how a lot of the game’s best features are also its worst. I loved the creativity in how it handled the touch screen, and I really liked how strongly implemented they were into the game. But it was still very clumsy to play, because it always required the touch screen, and it was implemented in a lot of ways that didn’t give you the best control for what you needed. Moreover Linebeck was insufferable. I relished the part where you got to fight him way more than I think I was supposed to. Fun fact: I was actually going into this review thinking I would give it a 5/10, but after laying out all of its shortcomings on the table, I went with a 4/10 instead. As I said, the only people who insist the Water Temple is the worst level in video game history are those who haven’t played this game and experienced the Temple of the Ocean King. It absolutely manages to hit all of the wrong notes – about the only thing that could’ve made it worse is if the Phantoms instantly killed Link upon striking him. I wouldn’t mind revisiting the same dungeon over and over if there was some option to skip past the portions you’ve played through already. Spirit Tracks did just that with the Tower of Spirits; you can go right to the new floors whenever you’re made to go back there. As it stands, I remember thinking it was really nice of them to include a halfway point only to take back my compliment seconds later when I learned it deducts the time it took for you to reach it from the hourglass. It makes revisiting the game incredibly tedious. That’s about how I’d sum things up; the game’s greatest strength is also its biggest weakness. Then again, even at its most awkward, there was never really a moment in which the control scheme cost me my chance at victory. If anything, I felt the game was a little too easy – I only used one potion in the entire playthrough. You know, as someone who has expressed more than a few contrarian opinions, I make honest efforts to see where those I don’t agree with come from. Linebeck is one of the very few instances where I found myself completely unable to do so because I honestly can’t believe he has fans. Similar to my thoughts on the Temple of the Ocean King, I’m convinced that anyone who thinks Navi and Fi are the most annoying video game sidekicks have never played this game and had to put up with Linebeck, and essentially making him the final boss was indeed oddly appropriate from a thematic standpoint. Too bad the rest of the game didn’t have that level of awareness. For that matter, I would go as far as saying he’s worse than Cedric from King’s Quest V. At least that game knew how annoying he was. Oh, boy, I missed this one when you originally posted it. Although I would certainly not give it a score as low as the one you did, I absolutely understand where it is coming from, because if I had to list my least favorite Zelda games both Phantom Hourglass and Spirit Tracks would be running for that spot, even if I am sure Zelda 2 would beat them by a large margin in that race. I agree that the items are a bit commonplace, but I feel the touchscreen controls that are involved in the usage of most of them end up making them fresh enough, and the dungeons and puzzles – despite their simplicity – are overall very good. But my highlights when it comes to this game are certainly the boss fights, so I am glad you gave them their well-deserved praise. The only time I played through Phantom Hourglass was upon its release. That is, some eleven years ago, and I don’t remember being that annoyed by Linebeck, but since I am planing a replay of numerous Zelda games, which will hopefully happen soon, I will see how my older self will react to him. As for the Temple of the Ocean King and the sailing (which I absolutely loved in Wind Waker), I do remember hating both, just like I remember feeling the touchscreen controls, though amusing when it comes to moving around and using items, were annoying when encountering tougher enemies. Between Phantom Hourglass and Spirit Tracks, I would say the former is worse by far. In fact, I was actually taken aback at how much of an improvement the latter managed to be (though I will admit it had its own issues). I can certainly agree that Phantom Hourglass isn’t as good as Zelda II – that’s for sure. I went into this review thinking it was better than Link’s Awakening, but when I began listing all of the pros and cons, I realized that, even if Phantom Hourglass has better boss fights, Link’s Awakening is at least more consistently good overall. Then again, that’s the thing with my scoring system – not all of the games achieve their scores the exact same way. I’d say this game achieved its score in a similar fashion as Mother 3 in that it there are a few things I really like about it (e.g. the boss fights), but the goodwill is weighed down by a treasure trove of annoyances. I was the opposite; I played Phantom Hourglass eleven years ago when it was released only for me to lose interest in it almost immediately. It wasn’t until a few months ago that I finally decided to complete it, and I was hoping maybe there was something about it I failed to appreciate. Nope, I was right the first time. In fact, in a lot of ways, it revealed itself to be even worse than I originally thought between Linebeck and the Temple of the Ocean King – the most annoying primary character in the franchise and the most annoying dungeon in the franchise respectively. I don’t need to be told I’m wrecking the Salvage Arm, Linebeck; I can see that for myself. And I agree that Spirit Tracks is an improvement. Mostly because it got rid of the most annoying aspects of the Temple of the Ocean King when building its central dungeon. However, I think riding the train is far more boring than the sailing that is seen in Phantom Hourglass. I would say I liked riding the train more than I did sailing in Phantom Hourglass, but not as much as sailing in The Wind Waker. Then again, Spirit Tracks is the next in line for my Zelda retrospective, so I’ll be sure to expand my thoughts at that time. I am looking forward to reading what you have to say about it!